I am notorious for ripping apart my magazines. Real Simple, Martha Stewart Living, Sunset, Country Living, Food and Wine...I have stacks of "good ideas" that I want to try, recipes I want to make, parties I want to plan, the way I want my Christmas tree to look, the perfect front porch, etc. I am never disappointed with Family Fun Magazine. Carving a watermelon like a Jack-O-Lantern was one of the many ideas I tore out of the latest issue. 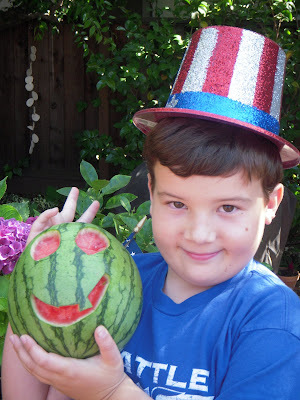 My son Jack was the designer/carver and he thought it was so cool that the red of the watermelon shows through.